AkshayaPatra – Page 2 – Food, Ramblings and More..
Today was yet another Sunday where thoughts of reviving this blog were playing peek-a-boo as usual. Of late, family and friends were enquiring when they would see a post. Sure, that was encouraging but of the umpteen things which occupied the week ranging from work, home and school activities, blogging always took a backseat. Did I mention that my toddler is now a second grader?? I was planning on a post for almost 5 years and even though I had made many recipes worthy of a blog post, my past experience with plagiarism and the fact that the pages of many of my fellow bloggers like Indira and Saffron Hut were dormant didn’t do much to stir me from my stupor. It was raining and I had just settled down with a cup of espresso. T was playing a game on her iPad and asked me how watermelon jam would taste. I promptly and proudly showed her a picture of it on this space. What followed were questions arising out of awe and curiosity as is expected from a 7 year old, “Did you make that?” “Who took a photo of that?” “What is a blog?’ and finally “Can we post something?”. Over the years, I have added a few appliances to my kitchen counter. Notably, the Philips Air Fryer and the Instant Pot stand out for their convenience. With the advent of the Instant Pot in my kitchen over the past few months, life has become a little easier. Though Indians are no stranger to stove top pressure cookers, Instant Pot has revolutionized that space with it’s ‘No Supervision Needed’ model. The Air Fryer helps by making delectables with less oil. Another use of the Air Fryer is to use it in the place of an oven. For today’s veggie omelette or frittata, I used the Air Fryer instead of firing up the oven. Along with the frittata, I made a Pina Colada smoothie. I simply love the combination of pineapple, banana and coconut. Beat the eggs with the heavy cream/milk/half and half. Add salt and black pepper. Stir in the onion and spinach. Pour the egg mixture into a greased baking dish. Bake in the air fryer at 360F for 8 mins. Sprinkle cheese on top and let it brown for another 2 or 3 mins. In case you are using the oven, bake it at 400F for 8 to 10 mins. You can add whatever you fancy to the frittata. Vegetables like mushrooms, bell peppers, potato, broccoli and cauliflower, meat like chicken, ham, sausage and non-meat options like tofu and soya chunks are all welcome. Add everything listed to the blender and blend till smooth. Add honey if needed. Enjoy! Overall, I feel very good that I checked off one item from my procrastination list, thanks to T! And the lunch was yummy too.. Give it a try! Wish you and your families a very Happy New Year! But anyway, today I made it a point to publish this simple recipe. We had gone vegetable picking twice over the last two months. Of the bounty which was gathered, were Cherry tomatoes – Wickedly red, deliciously ripe and mildly sweet. I have not tried them in anything other than a salad, to be devoured raw. Boil pasta as per the instructions on the package. Drain into a big bowl. Add the rest of the ingredients, except for the ingredients listed for the dressing and mix well. To make the dressing, whisk together the olive oil and lemon juice. Pour over the pasta and mix well. Set aside for 15 mins and serve. It can be served hot or cold. Plum or Romano tomatoes can be used instead of Cherry tomatoes. Reduce the quantity a bit and use about 1 and a half tomatoes. Wish you all a very Happy Vinayaga Chathurthi! This is one of my favorite pasta recipes and I make it very often. The sauce used is the mother of all sauces, the Bechamel. Nutmeg is a must in bechamel and blends with the milk to create an enticing base. Melt the butter in a saucepan, add the flour and stir till smooth. Let it cook for a couple of minutes till it turns a sandy color. Do not burn it. Next add the milk and whisk to remove any lumps. Cook till the sauce thickens, and keep stirring all the while to prevent lumps. Season with salt and nutmeg and set aside. Cook a cup of pasta as per the instructions on the pasta container. Drain. Saute a cup of frozen peas and 3 handfuls of spinach leaves, using a little oil. Cook till done. Add the sauce to the drained pasta, along with the sauteed vegetables. Add 1 Tbsp garlic powder and 1/2 Tbsp black pepper. Next add the juice of 1 lime. Adjust salt according to taste. Mix well and serve. The nutmeg in the bechamel sauce adds a very distinct flavor and binds the rest of the ingredients superbly in this simple pasta dish. This recipe goes to ‘Think Spice’ event initially started by Sunita of Sunita’s World and being hosted by Aparna of ‘My Diverse Kitchen’. 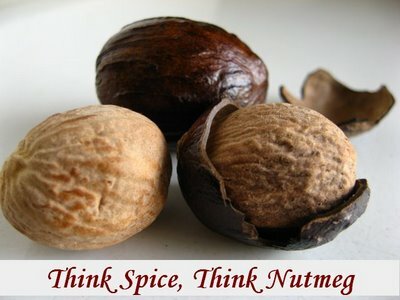 Aparna has chosen Nutmeg as the star ingredient this month. This is a simple Spinach dal which has been recreated on a lot many blogs till now. I have tweaked my mom’s recipe a bit and the result was very good. Instead of using tamarind to add the sour quotient, I used lime juice and I had no complaints. Wash toor dal and clean spinach. Dice the onion and slit the green chillies. In a pressure cooker, cook together the dal, spinach, onion, green chillies, asafoetida using about a cup of water. Once they are cooked, mash together to a coarse consistency using a wooden/steel ladle or a hand blender. Add salt as per taste. Next, juice the lime and add to the dal. Check for tartness and add according to your taste. Finally for seasoning, heat oil, add the turmeric, mustard seeds, cumin, urad dal and garlic. Wait till the mustard splutters and add to the dal.